A beguinage is a closed courtyard where widows and unmarried women led a religious inspired life under the leadership of a ‘grand dame’. The beguinage in lier, which dates from the 13th century, consists of 162 houses in 11 streets. It also has a convent and an infirmary, at the center of the beguinage is the St. Margaret's Church. The whole complex is surrounded by a wall, entrance is by a gate at the Schapenkoppenstraat or the Begijnhofstraat. The Beguinage in Lier, together with 12 other beguinages, became a UNESCO World Heritage Site in 1998. View location in Lier, Belgium. The current town hall of Lier used to be the cloth hall. Today, only parts of the façade are left from the cloth hall after a complete renovation from 1740 to 1745 by architect Jan Pieter van Bauerscheit. Inside the building a magnificent Rococo staircase is the main eye-catcher. Also worthwhile is the collection of paintings and antiques. Against the town hall stands the Gothic belfry tower. The tower dates from 1369 and was once part of the cloth hall. It is crowned with four corner turrets. These turrets were put there in 1911, when a renovation of the Belfry took place. The Meat House in Lier dates back to 1418 and had various functions during the centuries. It used to be the butchers' guildhall, since a few years it houses the cultural center. The building has been renovated and rebuilt many times. Its present facade is a Neo-Gothic reconstruction from 1920. The two lions at the entrance with the inscription S.P.Q.L., were originally standing outside the town hall, but were moved here in 1863. The Collegiate Church of St. Gummarus is one of the most striking examples of Brabantine Gothic style. Construction started in 1378 on the site where a Roman parish church once stood and was finished almost 200 years later. The oldest part of the church is the tower, its spire burnt down several times and was replaced by an octagonal Rococo bell tower. It now reaches a height of 80m. Highlights on the inside are the magnificent rood loft and the stained glass windows from the Middle Ages. The Buyldragershuisje is the former guildhall of the buildragers or dockworkers. It was constructed in the 18th century and was originally located on the Vismarkt in Lier. In 1958, the building was pulled down and was rebuilt on the Felix Timmermansplein, close to "De Fortuin". De Fortuin(Fortune) is a popular cafe-restaurant along the river Nete in Lier. The building was probably constructed in the 17th century. It was originally used as a storage place for grain, later it became a coal depot, a lemonade factory, a workshop and the town warehouse. After a restoration between 1962 and 1965, "De Fortuin" received its current function. 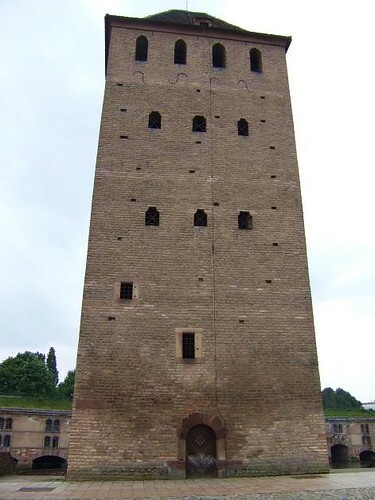 Lier's Zimmer Tower was originally part of the 14th century city fortifications. Since 1930 the tower houses the famous Jubilee clock made by Louis Zimmer. The clock consists out of one large dial in the centre, showing the exact time and 12 dials around the centre. These 12 dials show the zodiac, the solar orb and dominical letter, the weekdays, the terrestrial globe, the months, the dates, the seasons, the tides, the moon's age, the phases of the moon and the moon's orbit with epact. The four figures on the right side of the tower(last photo) represent the four seasons as phases of human life. Every day at 12 o'clock a hatch under theses figures opens, showing a parade of Belgian personalities between 1830 and 1930. 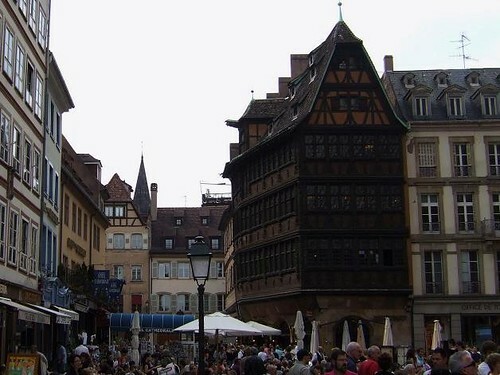 Built in 1427, Maison Kammerzell is the oldest building in Strasbourg that is still used commercially. The building was classified in 1929 as a historical monument and is renowned for its carved and ornate exterior. The interior features vaulted ceilings, stained-glass windows and is richly decorated with frescoes on all floors by Alsatian painter Léo Schnug. Located in front of the Cathedral of Our Lady of Strasbourg, Maison Kammerzell now houses an excellent restaurant and a three star hotel. 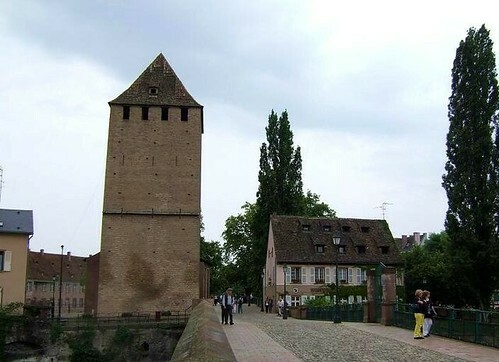 The Ponts Couverts or Covered Bridges across the river Ill, are part of Strasbourg's fortifications from the 13th century. The original bridges were made out of wood and covered by a roof. Along the centuries they were replaced by stone bridges and the roofs were removed. Today the three towers are all that's left from the old structure and its original name has stayed. The best views of the Ponts Couverts are from the panoramic terrace of the Barrage Vauban. View location in Strasbourg, France.